Pages selected as featured snippets receive a link at the top of the SERP, above traditional organic results. This effectively becomes the #1 Google ranking and generates lots of clicks to your website. Most pages selected for snippets already appear within the top 10 organic results for the same query but going from #9 to #1 is still quite a jump. While jumping to the very top of SERPs is possible through paid means (Google Ads), featured snippets represent a chance to do so organically. There is no method that can force Google to select your page and its content to be featured as a snippet on SERPs but following techniques that have been proven to improve the probability of selection is the best course of action. Questions can be answered in the form of paragraphs, bullet lists, or tables. 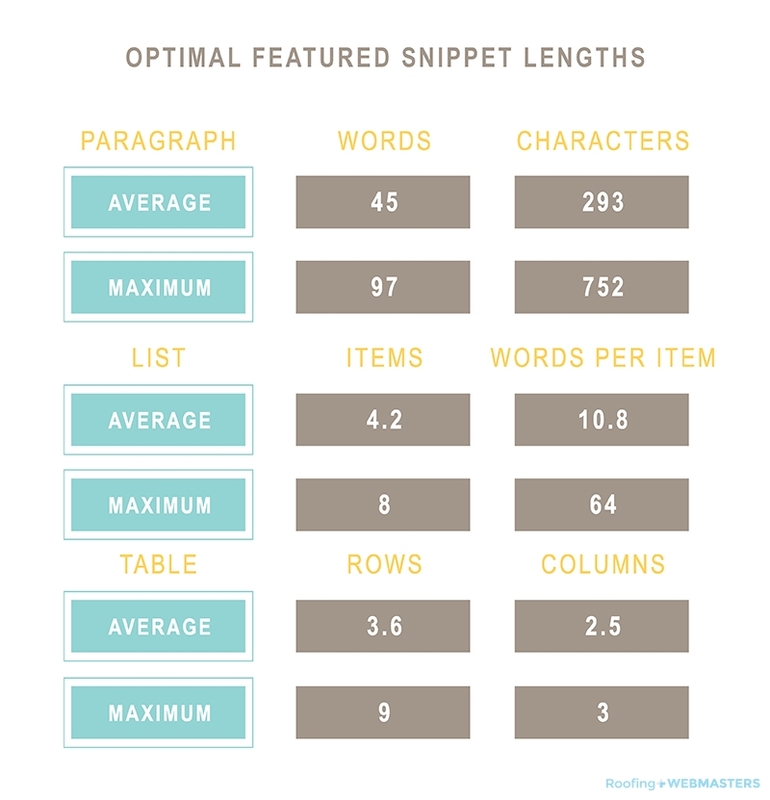 Research shows that paragraphs are most commonly selected as featured snippets. With this in mind, writing an informative answer to a common question (between 45-97 words) can put your page in a great position to be selected as a snippet. This presumes that you are already ranking on the first page for the keyword which is something that you can verify through a basic Google search or by utilizing tools like SEMRush or MOZ Keyword Explorer. Perhaps the greatest intrigue to featured snippets is their evening of the playing field. If you find it difficult to overtake a well established roofing company on traditional results, a snippet might be your answer to usurping them. Google often pulls images from anywhere on the page to associate with your featured snippet. Since you cannot tag which image they will use, you should ensure that each photo embedded on the page is worthy of being featured. One way to achieve this is to add a brand logo to every image. You can do this with a WordPress plugin like Image Watermark which will automatically include a watermark logo on each image (if enabled). While not every featured snippet displays an image, the ones that do tend to be even more appealing to users and typically generate higher click through rates. By associating your brand with each image, you can not only earn the #1 Google ranking but also entrench your brand within that highly coveted position. As for the image files themselves, following standard image optimization practices is a great place to start. You should always make sure photos on a page are relevant to the content, not only in a visual sense, but also via alt text. Since Google cannot yet define an image based on vision alone, it relies on alt text and file name when crawling your website. Stock images should be avoided in most cases especially for roofing company websites. Consumers would much prefer to see original and unique images taken on your jobs and of your employees than those that are found in royalty-free image libraries. Similarly, a featured snippet image that is appealing is more likely to maintain its spot on the top of SERPs and generate quality traffic. Updated on February 27, 2019 at 4:08 pm by Roofing Webmasters.